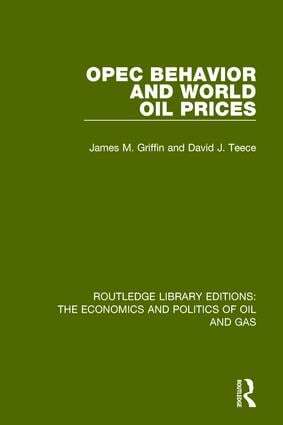 This volume, originally published in 1982, brings together economists, political scientists and industry experts to explain OPEC’s past achievements and future (in the early 1980s) prospects. The book opens with a clear, concise amd easy to follow treatment of the economics of exhaustible resources under monopoly and competition, the framework frequently used to examine pricing issues. The role of wealth maximisation, wealth satisficing and political factors as OPEC objectives are discussed and implications for world oil prices assessed. The stability of OPEC and the limitations of its pricing policy are examined and OPEC oil pricing and importers’ policies analysed.